There aren’t many six year olds that leave home to become a dancer. That’s apart from Edwin Sanz. He was only six when he joined the Grupo Madera dance group, which promotes Afro-Caribbean and Afro-Venezuelan culture through dance and music. For the next twelve years, Edwin Sanz toured Venezuela and traversed South America and Europe. During that period, he lived and breathed dance and music. It was also during this period that Edwin Sanz learnt to play percussion. Little did anyone realise that through practise, persistence and determination, Edwin Sanz would become one of the most talented Venezuelan percussionists of his generation. He’s made a career as a percussionist, and worked with some of the biggest names in music. However, over the last couple of years, Edwin Sanz has been forging a solo career. He released his debut album San Agustin to critical acclaim in 2014. Two years later, and Edwin Sanz returns with Overflow, which will be released on the 23rd September 2016, on Alex Wilson Records. 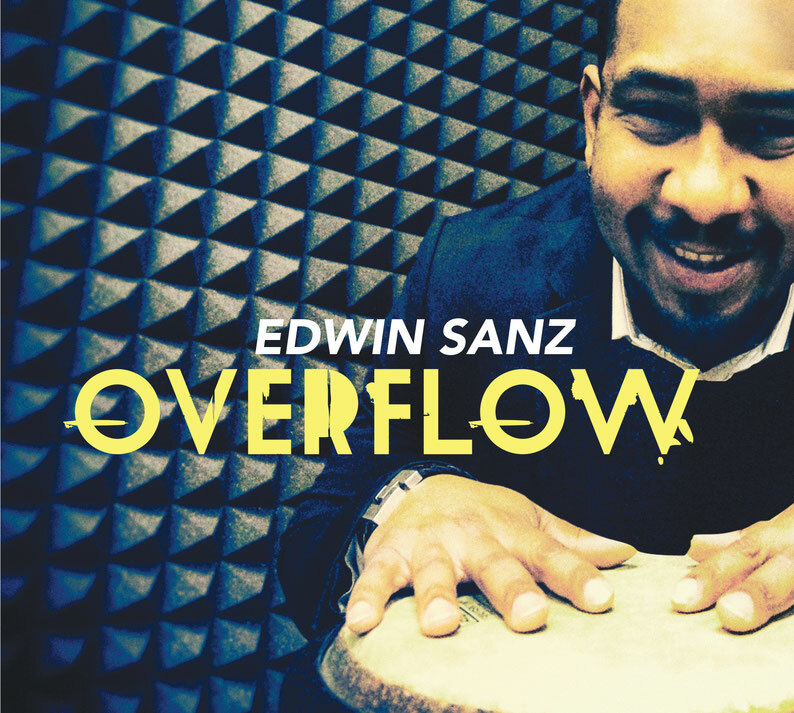 Overflow features Edwin Sanz showcasing his considerable and remarkable skills. These skills Edwin Sanz has spent a lifetime honing. The Edwin Sanz story begins in Caracas, Venezuela, in the working class district of San Augustin del Sur. That was where Edwin Sanz was born into a large, but loving family. Money was tight, with all the children sharing the one bedroom. However, one thing played an important part in family life, Afro-Venezuelan culture. This had played a big part in his family’s life. They weren’t from Caracas, Instead, they had moved from Barlovento, where Afro-Venezuelan culture is particularly strong. Music and dance play an important part in everyday life. That was certainly the case with Edwin Sanz’s uncle. Growing up in Barlovento, dance played an important part in Reinaldo Mijares’ life. However, Reinaldo Mijares was a talented dancer. So much so, that eventually, he became a professional dancer and choreographer. That was what Reinaldo Mijares was doing when Edwin Sanz was born. By the time Edwin Sanz was six, he followed in his uncle’s footsteps. Reinaldo Mijares introduced Edwin, his young nephew to the Grupo Madera. They wanted Edwin to join the Grupo Madera as a dancer. His family encouraged Edwin to join the Grupo Madera as a dancer. This was not just a way to escape poverty, but an opportunity to see the world. So the six year old seized the opportunity, and left his family home in Caracas. For the next twelve years, Edwin was totally immersed in Afro-Caribbean and Afro-Venezuelan culture. By the age of fourteen, Edwin was a “fully-fledged” member of Grupo Madera. By then, Edwin began to show an interest in making music. This was a game-changer. WIthin Grupo Madera, Edwin Sanz was regarded as a talented dancer, who was an important part of the troupe. Surely, he could’t be contemplating turning his back on music? Not yet. However, Edwin was interested the percussion, which played such an important part in the music Grupo Madera’s danced to. So Edwin began to learn and practise percussion as the group travelled far and wide. The Grupo Madera toured Venezuela and traversed South America. Sometimes, they travelled to Europe. Throughout these tours, the Grupo Madera were familiar faces on television shows. During that period, dance and music was central to his life. Edwin Sanz literally lived and breathed music. Meanwhile, he had a dream. Edwin Sanz dreamt of embarking upon a career as a musician. So, when he wasn’t dancing, Edwin was practising and perfecting his skills as a percussionist. Already, Edwin was beginning to look beyond life as a dancer. Eventually, after twelve years touring with the Grupo Madera, Edwin decided to leave the group. This was a huge step for him. By then, Edwin Sanz was eighteen, but had spent the best part of his life with the Grupo Madera. For twelve years he had toured and performed with them. He grew up on the road, in what Edwin describes as the “school of life.” It was also where Edwin served his musical apprenticeship. Now he wanted to put into practise what he had learnt. So as a new millennia dawned, Edwin Sanz headed to Europe to develop his skills as a percussionist. First stop for Edwin was Paris, France. That became Edwin’s home for a few years. After that, Edwin decided to move on, and eventually, settled down in the beautiful city of Geneva, in Switzerland. The Swiss city became his adopted home. Since then, Edwin has kept busy. Not only does he teach music, but has played with many bands and artists. This includes a number of years as conguero with the European based band Mercadonegro. It’s a role he continues to fulfil. Similarly, Edwin Sanz continues to take to the stage, as they traverse the globe with Rodrigo and Gabriella’s Cuban Area 52 project. That however, is just part of the story of Edwin Sanz’s musical career. He’s gone from session player to sideman, working with the likes of Adalberto Santiago, Africando, Gypsy Kings, Jose Alberto Canario, Cruz. They’ve all featured the percussive skills of Edwin Sanz. So have Isaac Delgado, Malia, Richie Ray and Bobby. Edwin Sanz it seems, the hardest working man in Latin music. However, one man that’s worked with Edwin, is Alex Wilson whose played an important part in his new album Overflow. Alex Wilson co-produced Overflow, the much anticipated followup to Edwin Sanz’s debut album San Agustin. Overflow features nine tracks where a talented, all-star cast accompany Edwin. Together, they fuse salsa, Latin grooves and gospel-tinged vocals combine to create a delicious and heady brew. To record Overflow, Edwin Sanz and his multinational band headed to Chamonix, and the studio of French pianist Andre Manoukian. That was where percussionist Edwin Sanz was joined by his countryman, trumpeter Oscar “Chucky” Cordero. He’s one of the leading lights of Venezuela’s nu-salsa scene. Among the other band members are British saxophonist Paul Booth, who is joined Greek bassist Dimitris Christopoulous. Co-producing Overflow with Alex Wilson, is Nicky Brown, vocalist with the London Community Gospel Choir. He plays an important part in Overflow. It’s a magical musical mystery tour, where familiar songs are reinvented and transformed into something totally different. Never before has Screaming Jay Hawkins’ I Put A Spell On You and Level 42’s Something About You. That’s just part of what’s a captivating musical story, Overflow. We’re Blessed opens Overflow. Just the sound of a radio changing channel greets the listener, until harmonies usher in Nicky Brown’s vampish male vocal. It’s accompanied by the bass, a myriad of Latin percussion, keyboards and stabs of blazing horns. Meanwhile, Nicky’s soulful, impassioned vocal is accompanied by gospel-tinged and cooing female harmonies. They feed off each other, encouraging each other to greater heights of soulfulness, drama and emotion. Later, Edwin’s percussion is joined by a bass that soon becomes uber funky, while bursts of horns soar above the arrangement. Still Nicky’s vocal and harmonies continue to reach new heights of soulfulness. Together with the multitalented band, they create a joyous and irresistible sounding fusion of soul, funk, gospel and Latin music, which whets the appetite for the rest of the Overflow. Ella is a piano lead track, where synths and percussion provide the backdrop for a heartfelt vocal. It’s delivered with emotion, as horns bray and blaze, as the bass joins a twinkling Fender Rhodes and futuristic synths. Soon, though, musical cultures combine to create a delicious slice of dance-floor friendly music. Jazz, soul and salsa are the vital ingredients, as horns, percussion and the bass accompany the vocal, while joyous harmonies add the finishing touch. By then, it’s almost impossible to keep still on what’s a joyous and glorious call to dance, that’s guaranteed to get any party started. Anyone who knows and loves the blues, will be familiar with Screaming Jay Hawkins’ I Put A Spell On You. Here, it’s reinvented, and heads in a totally new and unexpected direction as a female vocalist delivers a vocal powerhouse. It’s soulful and spellbinding, as she delivers and lives the lyrics. Meanwhile, scratches add a hip hop influence; while a myriad of effects, join stabs of synths and occasional whoops and hollers. They’re joined by Latin percussion, mesmeric keyboards and growling horns. They’re raison d’être is to accompany the vocal as soul and jazz combines. Still, futuristic sounds punctuate the arrangement, but gradually, though, the Latin influence grows. So does the hip hop influence, as a soulful rap is unleashed. By then, the genre-melting describes the arrangement. So does dramatic and captivating, as the vocal become a vamp where, blues, soul and jazz combine. As the song reaches a crescendo, one can’t help but press play again, and revel in this mini musical masterpiece. Something About You was originally recorded by Level 42. For Edwin’s cover, Mike Lindup of Level 42 makes a guest appearance. The arrangement is very different. Latin percussion is to the fore, and is augmented by a piano, keyboards, bass and braying horns. Later, the arrangement becomes jaunty, as harmonies accompany Mike’s soulful, heartfelt vocal. When it drops out, piano pick up the baton. On its return, Mike’s vocal is accompanied by piano, cooing harmonies and blazing horns. They combine to reinvent an eighties classic. Eres Tu`meanders into life, with the synths joining with a bass, Latin percussion and a Spanish guitar. They provide the perfect backdrop for a tender, but souful vocal. Soon, though, the piano is adding a jaunty backdrop as horns bray and blaze while a cowbell rings out. By then the tempo is rising, as another delicious slice of salsa unfolds. Although the lyrics are romantic, there’s a sense of melancholia. There’s also a sense of soulfulness, while the Latin percussion, piano and braying horns combine. Harmonies augment the vocal, on what’s a beautiful, melodic and captivating slice of musical sunshine. A roll of drums ushers in the band on Còmo Olvidar. Horns join with the bass, piano and percussion in creating a backdrop for the vocal on this emotive ballad. Meanwhile, the band create a glorious backdrop where the piano joins with the bass and percussion, while stabs of horns punctuate the arrangement. Harmonies are added, before the vocal drops out. Briefly, the band get the opportunity to showcase their skills. They play with flair and flamboyance, before the vocal and then harmonies return. From there, they become one with the band, combining musical genres and influences to create what can only be described as alluring and inviting feel-good music. Alas, all too soon, the song reaches a crescendo. leaving just the memory of four magical minutes. Rasping horns and keyboards join the and percussion on De Mujer A Mujer. Horns reach blaze, and the arrangement almost grinds to a halt. This signals the entrance of a beautiful, heartfelt female vocal. It grows in power and emotion, while the keyboards, growling horns and percussion provide the perfect backdrop. Harmonies augment the vocal, as it veers between soulful to jazz-tinged. Meanwhile, the bass prowls, as piano, percussion and rasping horns match the vocal every step of the way. They combine elements of jazz, Latin and soul which is combined with a healthy dose of salsa. The result is a dreamy, slice of summery music whose beauty captivates and compels. Yo Vengo De Venezuela closes Overflow. Percussion rings out, and combines with joyous vocals and a piano. Soon, they’re joined by stabs and braying, blazing horns. Meanwhile, the vocal sings call and response with backing vocalists, as percussion, piano and horns power the arrangement along. Later, when the vocal drops out, keyboards take centre-stage, before horns enjoy their moment in the spotlight. When the vocal and harmonies return, this irresistible slice of hook-laden salsa ensures that Overflow closes on a high. That’s certainly the case with Overflow, Edwin Sanz’s much anticipated sophomore album. It will be released on the 23rd September 2016, on Alex Wilson Records. Overflow, quite simply is one of the best Latin albums of recent years. Although Overflow features just nine slices of glorious salsa lasting forty minutes, every one is a winner. They feature Edwin Sanz and his multitalented, international band reinventing old songs and introducing the audience to new ones. To do that, they combine elements of Afro-Venezuelan, funk, gospel, hip hop, jazz, Latin, rock and soul. However, Edwin Sanz’s speciality is salsa, and Overflow is a modern salsa album. It’s salsa for the twenty-first century. Edwin Sanz doesn’t just deploy the instruments that one expects to feature on a salsa album, but adds a myriad of sounds, effects, scratches, and even a rap. Then there’s the various guest artists who feature on Overflow. This includes Nicky Brown of the London’s Community Gospel Choir, who adds the vocal on We’re Blessed. Mike Lindup of Level 42 delivers the vocal on Level 42’s eighties classic, Something About You. Both tracks are reinvented and takes on new meaning. However, there’s more to Overflow than two songs. From the opening bars of We’re Blessed, right through to the closing notes of Yo Vengo De Venezuela, Overflow is an album that oozes quality. The music is variously beautiful, captivating, joyous and melodic. Edwin Sanz also creates music that’s dance-floor friendly and truly irresistible. Quite simply, it’s a magical musical mystery tour through genres and influences, with Edwin Sanz as the tour guide. He’s one of the finest percussionists of his generation, and one of the rising stars of music. That’s apparent throughout Overflow, where We’re Blessed to hear Edwin Sanz’s beautiful, joyous and uplifting, genre-melting music. It’s guaranteed to get any party started, where everybody dances with Edwin Sanz. So take my advice, and grab a copy of Overflow, and let Edwin Sanz put a spell on you. ← FRIGHTENED RABBIT-PAINTING OF A PANIC ATTACK.